Meat is the important part of the GM Diet and it is to be had on day 5 and day 6 of the diet program. I’m sure many people don’t like to eat Beef in India and few other countries. Those people can substitute beef with Chicken. You can either prepare a chicken soup or simply cook it on the grill without the skin. First of all, make sure you bring home 500gms of skinless chicken for your diet. Since the skin contains more fat, we ignore it while on the General Motors diet. Salt & Pepper as required. 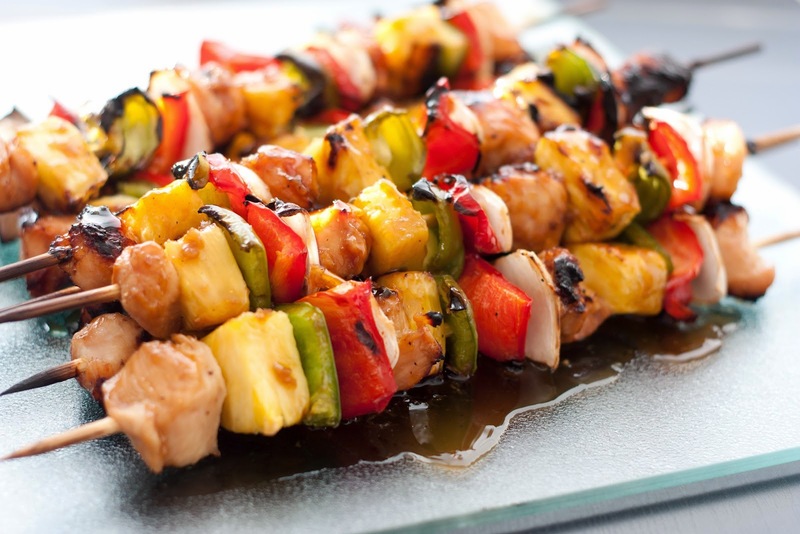 How to Prepare Grilled Chicken Kebab for GM Diet? Take the chicken pieces and skew them together on barbecue sticks with all the ingredients including Bell peppers, onions, and tomatoes. Next, rub them with Olive oil, salt and pepper on all the sides. Place them on a grill or oven and cook them until all the pieces become tender. In case you don’t have a Microwave, you can simply put them on an open fire (stove) and fry them. That’s all! Your Chicken Kebabs are ready to be served. Garnish them with Cucumber while serving. PS: We are using Olive Oil to cook the Chicken Kebabs as it contains good fatty acids. Salt, Pepper and mixed herbs to add some taste to the soup. 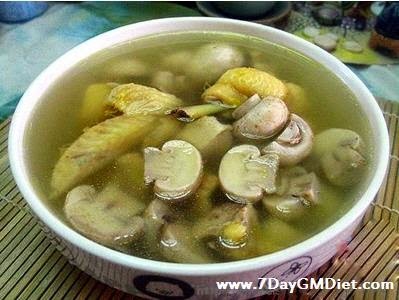 How to Prepare the GM Diet Chicken Soup? Add 2 teaspoons of Olive oil in a pan and then fry the Onion, garlic, carrot until tender. Next, add the chicken pieces and fry for another 3-4 minutes. Add chopped tomatoes and other spices as required. Pour enough water to boil. Let the soup boil for 30 minutes in SIM mode. 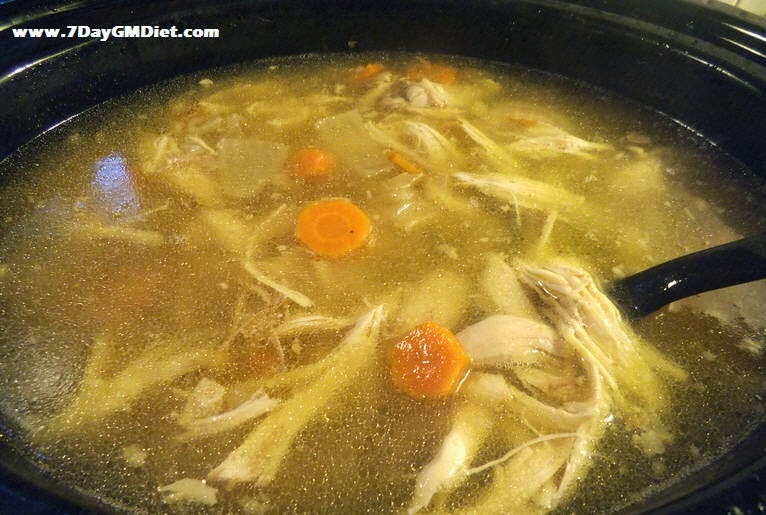 This Chicken soup recipe is very straightforward and will taste good. If the hunger pangs hit you, then this non-vegetarian soup is your best buddy, but remember that you should have this soup only on Day 5 and Day 6 of the General motors diet at Lunch and Dinner time. How to Prepare Chicken Soup with Mushrooms? First of all, take a pan and fry the onions, garlic, ginger, mushrooms, green chilies and celery until tender. You can use virgin olive oil to fry the ingredients. Next, add the chicken pieces and fry them for another 4 to 5 minutes on a low flame. Pour enough water to boil and add the remaining spices (salt and pepper as req) into the bowl. Let the chicken soup be cooked for around 25 minutes in SIM mode or until 4 to 5 whistles if you’re using a cooker. Once done, pour the soup in a separate bowl and serve it hot. Please make sure that you need to drink the soup immediately, and do not re-boil it or refrigerate it as doing so will spoil the taste. That’s all friends! What are you waiting for? If you’re following the General Motors diet program, then you can include this chicken soup on your non-vegetarian days like day 5 and 6. Next Post:How to Prepare Brown Rice Pulao with Moong Sprouts?